Denim, denim, denim – where would menswear be without it? It forms a significant part of our wardrobes, the backbone if you will, and has done so now for centuries. Despite its perennial presence, denim has in fact been recognised as a major trend for this spring/summer. Designers such as Valentino and Calvin Klein have had their say and are championing this most rugged of fabrics for the season; using it for everything from tuxedos and suits to full denim ensembles. Whilst its popularity is undeniably enduring, in its traditional guise of jeans, denim isn’t the most comfortable choice for warm weather. Step forward the denim/jean short. Breezier than its full-length counterpart and far more weather-appropriate, especially as we begin the transition into autumn, denim shorts are a serious alternative to chino versions and a popular choice for denim-heads and streetwear aficionados come high summer. Although they are still a controversial style for some, over the past couple of years denim shorts have cemented themselves as a casual summer staple. This popularity is highly unlikely to wane either, especially with mums and students up and down the country lopping old jeans into this shorter alternative – something we so happen to have a very handy guide to. After all, we can’t have you wandering around in mis-cut, lopsided jean/short hybrids can we? Whether your denim shorts are a D.I.Y. effort or a more conventional purchase, the first thing to understand is that they are a casual piece. Although the short suits debate is currently dominating menswear – and shorts continue to plot to take over the realm of smart-casual – denim shorts won’t be fighting in the vanguard for this one. They will be firmly left behind to hold down the fort on the more casual side of the divide; pair them with tees not ties. Length, as ever with shorts, is imperative. A knee length finish gives off a more relaxed air that is suited to casual ensembles, but they should certainly not extend further, they are shorts after all. Any longer and you encroaching on three-quarter length territory – i.e. sartorial wasteland. Opting for a slightly higher cut that finishes a couple of inches above the knee will increase versatility. It’s certainly the cut favoured within current industry trends, especially when looking to dress shorts up a notch from typical t-shirt and trainer combinations. Whatever length you favour, keep your shorts free from overpowering pockets and general bulk. They may be a more casual summer option but they still need to retain clean lines, and cumbersome side pockets certainly won’t aid this. A roll-up or two at the hem, especially if your shorts are D.I.Y. effort, is a nice finishing touch that shows you pay attention to the finer details. As previously mentioned, denim shorts are an incredibly casual piece. Stay true to their streetwear roots and utilise them in this way by pairing alongside a similarly casual t-shirt. The printed tee is currently enjoying a bit of a moment after a recent bout of style stigma and it makes the perfect foil for off-duty denim. Florals have been a major print trend this season. Work them into your look through the t-shirt and bring the outfit up a notch with some slightly smarter footwear, in the form of a pair of tassel loafers. Double-denim: it never fails to spark debate or raise eyebrows when done wrong. However, when done right the Canadian Tuxedo is a superb style statement that will turn heads for all the right reasons. This contrast sleeve jacket is bang on trend and makes mixing your denims that much easier due to the non-standard colours used. Layer a simple v-neck tee underneath and combine with light denim shorts to complete the double-denim ensemble. Bite the bullet and take steps to dress up this most casual of garments. Don’t look to break them into the shorts suit domain; an unstructured blazer offers a low risk way of working them with tailoring. A burgundy blazer over a short-sleeve patterned shirt is both seasonally-appropriate and dressed down enough to complement the denim shorts. If you want to be able to dress up your denim shorts, look for solid coloured versions with minimal fading, bleaching or distressing. The pair below come in a deep, rich blue tone that almost gives them the appearance of smarter chino shorts, enhancing their versatility and enabling them to be paired with smart-casual pieces. Denim shorts have built on their popularity from 2012 and cemented themselves as a true spring/summer staple – perfect for brisk mornings yet light enough to wear as the temperature creeps up. Although strictly a casual option, it is these same qualities that will ensure they remain popular as we progress through to autumn. With the material having now firmly established its place within our wardrobes all year round, denim is, and forever will be, a dominant menswear force. Are you a self-confessed denim-head? 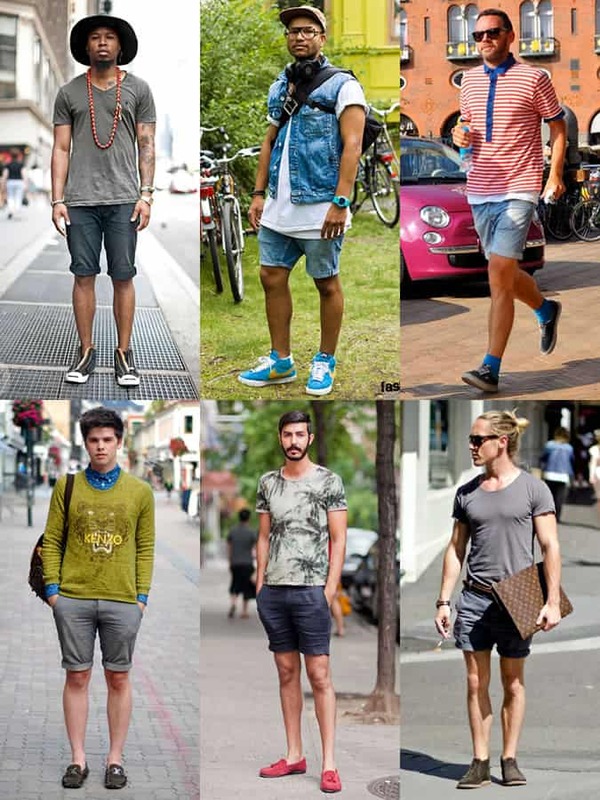 What are your thoughts on denim shorts? Does denim work in the height of summer? How do you like to style your denim shorts?